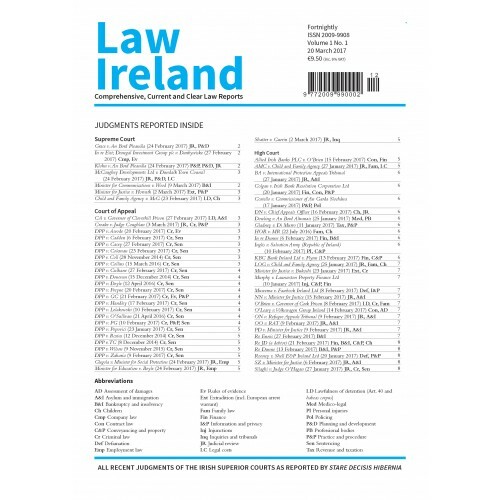 Law Ireland , a journal for the Irish legal profession. This is a collaboration between the publishers of History Ireland , and Books Ireland, and the publishers of Stare Decisis Hibernia. In recent years, increasing numbers of judgments have been delivered by the Irish superior courts. Many Irish lawyers have been overwhelmed by this volume of legal precedent, and find it difficult to keep track of new developments. Since 2011, Stare Decisis Hibernia has published short, readable, reports online, on all new judgments of the Irish superior courts. It now has a fully searchable database of over 5,000 reports. We are now launching Law Ireland , for lawyers who need a fortnightly briefing on recent Irish case law. 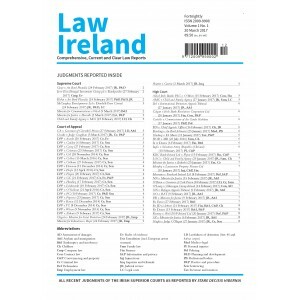 Law Ireland is published fortnightly during the legal terms, and once during the long vacation (at the beginning of September). The cover price is €9.50 per fortnight. An annual subscription costs €175.00. As an allowable business expense, we believe this offers excellent value for busy lawyers, and will save precious time in searching for the latest judicial authorities.